A large tree to 90 feet or more and a trunk to 3 feet in diameter, with a dense, round crown of dark green foliage. Occurs along the borders of swamps and streams and on rich bottomlands in East Texas, west and south to the Colorado River. Simple, alternate, 2" to 4" long and 1" to 2" wide, obovate or slightly three-lobed at the outer end, bristle-tipped, thin, dull bluish-green above and lighter green beneath, persisting on the twigs late into winter. Juvenile leaves are highly variable and have a mix of sharp teeth and rounded lobes. Separate male and female flowers appear on the same tree in spring when the leaves begin to unfold; male flowers are borne on a yellowish catkin 2" to 3" long; the female flowers are less conspicuous and clustered on a short stalk. An acorn, requiring two years to mature, 0.5" to 0.75" long and wide, light brown or yellowish-brown and enclosed only at the base in the thin, saucer-shaped cup. Smooth, light brown to dark gray, with many thin scales over the surface; developing broad, smooth plates on older trunks. Heavy, hard, and strong, light brown in color, with lighter-colored sapwood; utilized chiefly for crossties, fuelwood, and pulp. Willow oak (Quercus phellos) has narrow, linear leaves and rougher bark; laurel oak (Q. laurifolia) occurs only on very wet sites and has semi-evergreen, elliptical leaves. 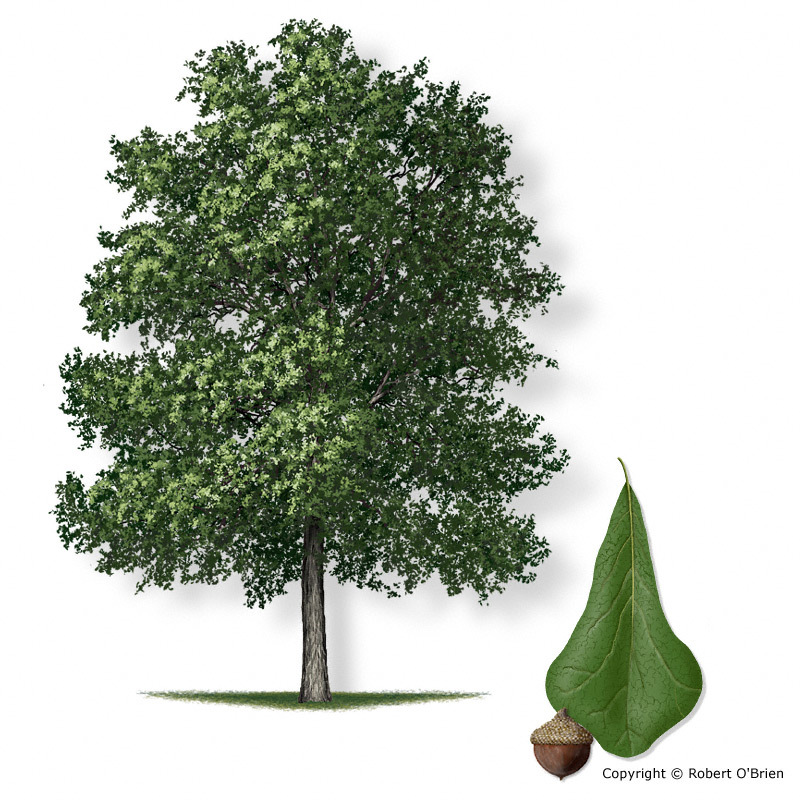 Along with several other oaks, water oak is commonly referred to as "pin oak" because of its similarities to the true pin oak (Quercus palustris), except for leaf shape. This name is almost generic for any unknown oak species.